Travel down a path, ensconced by a geodesic dome and lit by projections of the celestial sky, to explore the sprawling sculpture at its center. A floating topographical representation of the Portland metro area is seen through the obsessive compilation of hundreds of digital satellite images. Allow the eye to roll over the exhibit’s mountains and valleys and wind through the rivers. Give into the perspective of the creation only to be brought back to reality by the mechanisms of the installation—the lighting, special effects, and structural components which draw you to the dome, and its safety and subjectivity. The experience is part of the new full-sensory exhibit, Domicile, orchestrated by local artists Tyler Corbett and Erinn Kathryn. The duo create art under the moniker Corbett/Kathryn (“Subjective Cartogrpahy,” Issue No. 8). 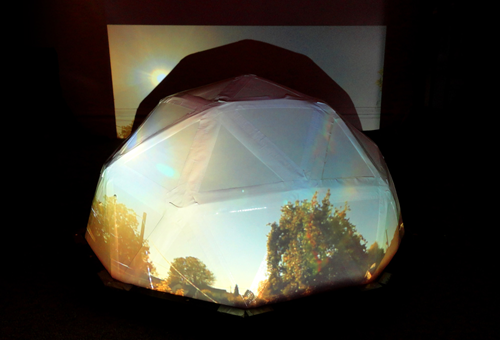 The geodesic dome is a shell created from a network of great intersecting circles. The structure, Corbett explains, is a symbol of the encompassing environment that restricts or embellishes our understanding of a subject, in this case the topographical sculpture at the center of the installation. Corbett/Kathryn characterized their centerpiece as the earthly embodiment of the “obsessive present.” A concept described by Corbett as not only the global culturalization of data-heavy, compulsive consumption of media, but also the daily confrontation of new responsibilities which make real the exit from childhood and entry into young adulthood. Explore Corbett/Kathryn‘s work at Lightbox Kulturhaus (2027 NE MLK Jr. Blvd.) from Oct. 24 to Oct. 26 to see how the consumption of digital media changes the landscape of our lives.